Stevens’ Racket | The Goose Is Out! 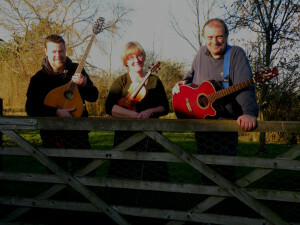 Stevens’ Racket are a Kent based three piece band playing arrangements of George Stevens’ own compositions in the folk/ world/ acoustic genre …on guitar, violin, pipes, bouzouki and accordion. They came to the Goose to support Jim Moray at The Crown and Greyhound, at which time they had a new CD out on release, “A Toad in the Hand”. Click here to find out more about George Stevens and Stevens’ Racket and to hear their music! George is also a luthier. Click here for more info and soundclips on George’s luthiery website!